It seems like just about everyone loves Red Velvet Cupcakes. 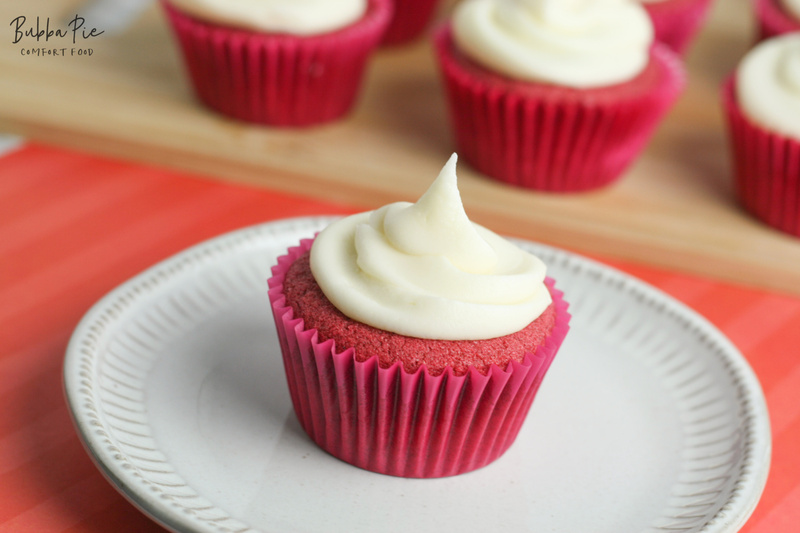 Now you can have one of the most popular cupcake recipes without the gluten! 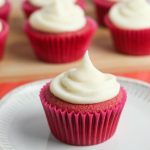 This easy Gluten Free Red Velvet Cupcake Recipe will win the hearts and taste buds of all your friends and family no matter what their diet is. LOOKING FOR MORE GREAT DESSERTS? CHECK OUT MY EASY BREAD PUDDING RECIPE AND MY BLUEBERRY MUFFINS RECIPE! This website focuses on comfort food. And there is just something about red velvet cake that is incredibly comforting. 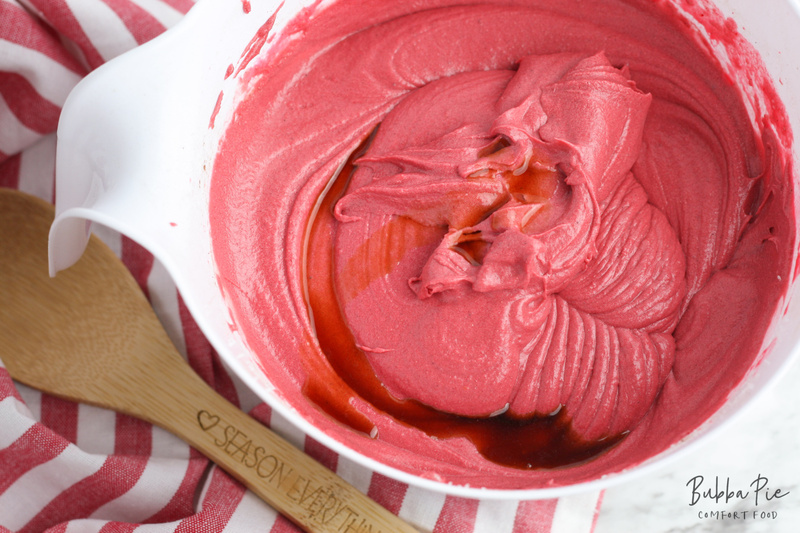 Whether it is cake, cupcakes or cookies, that rich red color and the moist texture is sure to be the cure for just about anything that ails you. But, if gluten is what ails you, that could be a problem. 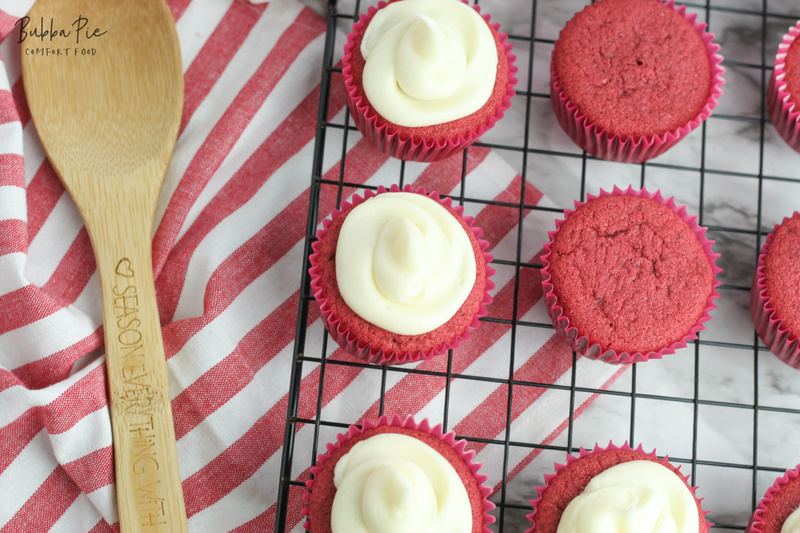 This is why we have come up with this gluten free red velvet cupcake recipe! A lot of people wonder if there is really any difference between red velvet cake and chocolate cake other than adding some red food coloring. The answer is: yes! Traditionally, red velvet cake has less cocoa powder in it than a chocolate cake. A red velvet cupcake will still have a chocolate taste to it due to the cocoa powder, but not nearly as much as your traditional chocolate cake or cupcake. 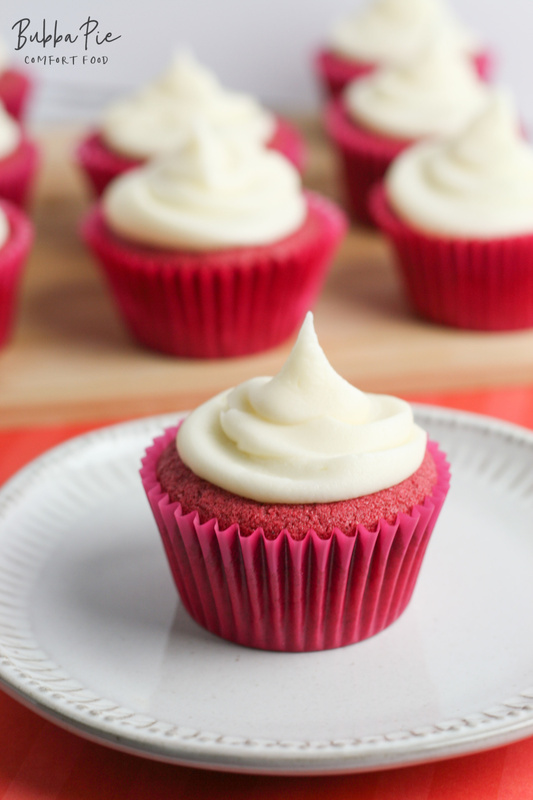 A red velvet cupcake recipe also usually includes buttermilk, which gives it that deliciously light and fluffy texture. And red velvet cake is most often topped with white cream cheese icing, which rounds out that iconic flavor that we all know and love. The list of ingredients is pretty easy and basic. The one curve ball is to make sure that you use the gluten free baking flour, which is easy to find at your local super market. Other than that, learning how to make red velvet cupcakes with cream cheese frosting is pretty easy! First, just gather up the ingredients. Combine sugar and butter in a large bowl and beat until fluffy. Add the eggs one at a time, mixing between each addition. Add cocoa powder and mix until combined. Add food coloring and stir, adding more coloring if needed until desired color is reached. In a separate bowl, sift together flour and salt. Add flour mixture to butter mixture one cup at a time, alternating with ½ cup buttermilk until all of both ingredients are added. In a small bowl, combine baking soda and vinegar. Add mixture to batter and mix well. Line a cupcake tin with cupcake liners. Fill each liner 2/3 of the way full with batter. Bake for 12-15 minutes, or until a toothpick inserted into the center of a cupcake comes out clean. Allow to cool in the pan for a few minutes, then transfer cupcakes to a wire rack to cool completely to room temperature. In a large bowl, combine cream cheese, butter, and vanilla. Beat until combined and fluffy. Add in powdered sugar ½ cup at a time, mixing well between each addition, until desired consistency is reached. Pipe the icing onto each cupcake. I love the look of that dark, deep red color with the bright, white icing! 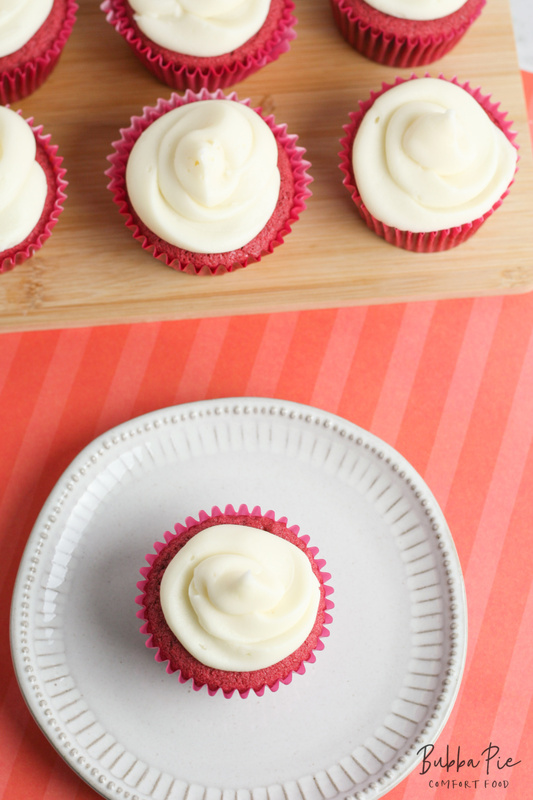 These gluten free red velvet cupcakes look good enough to eat! Don’t mind if I do!